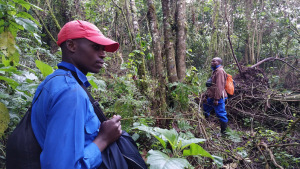 I have always wanted to do the Trek to see the Gorillas! 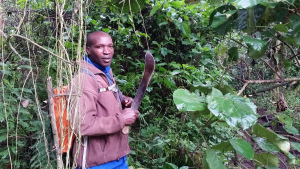 Here are amazing pictures of this travel writer being within touching distance of these beautiful silverbacks! 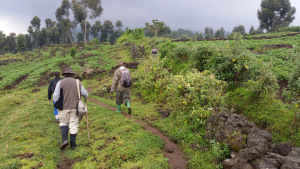 If there was rain that day or the previous day, you may want to consider hiring a “porter” who will carry your bags, equipment, and help you navigate the muddy incline. I decided today to talk about Woman Travel and the Group that our Company launched in October of 2012. I started this group because I had had several woman in our local area talking about traveling alone, why the single supplement stops them from traveling and some just wanting other woman to travel with so they feel safe and to gain more friendships with people that had similar interests. Several woman that were booking with me had husbands that didn’t like to travel so they would get together and travel as a group. So the need was definitely there for a group of this nature. On our trips one of my agents always accompanies the group. We always plan dinner the first night at destination so everyone gets to meet everyone. The tours change with each destination, some are what the client picks and they do on their own (or with others that are also going) and some are all group tours where we are together more. I started with a facebook page and asked people what they thought our group should be called. After a contest we came up with “Her World Travels”, We invited people to join our page and it took off from there. I try and post information that woman would like to see. Articles regarding Single woman traveling alone, how to pack, and information on destinations. The top four destinations that people wanted to visit were Ireland (one of my top 3 destination I have been to), San Francisco, New York and New Orleans. Our San Francisco trip was October of 2013. We had 15 people go and it was so much fun! New York Trip was June of 2014, and New Orleans is set to go in October. Ireland is being planned for June 2015. We have since changed our name and we are called Traveling Divas. Love the new name! What do I hope for this group? That we can have people joining us from all over the world to enjoy destinations as a group and make new friends and feel safe while traveling. Its been a year and a half and its steadily growing. Check us out on http://www.facebook.com/thetravelingdivas. Vulcan Vacations has several groups under our company. We have branched off to Destination Weddings and Honeymoons, Ladies Only Travel, South Africa and we are looking at launching a Men’s Only Travel Group. 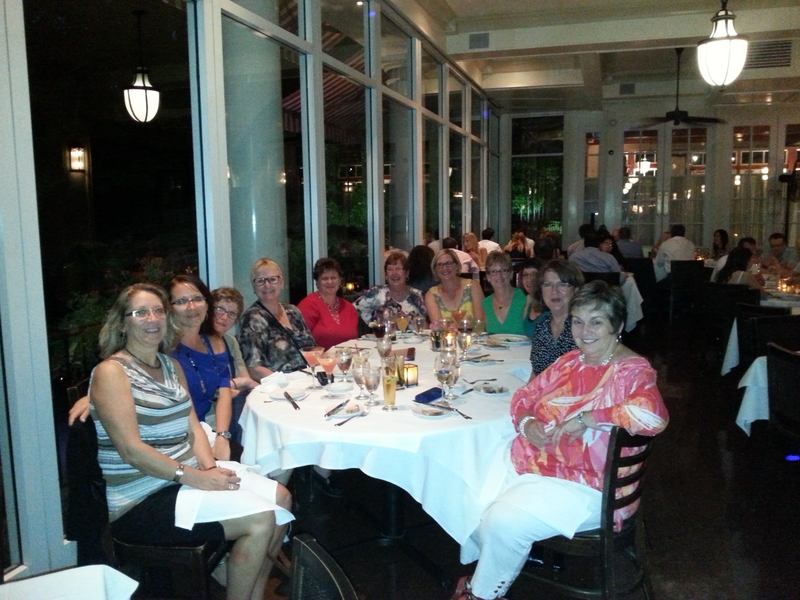 Our Ladies Only group just returned from a 5 day trip to New York City! I just spoke with my agent that accompanied them and she said it was a fantastic group and New York has a lot to see! I already knew that it’s a fantastic place to visit as I took a ladies group there 2 years and ago and can hardly wait to go back! They left on a Wednesday morning and landed in New York at 5:30pm. After they were private transferred to their Hotel, Novatel Times Square, they got settled and then dined together at the fabulous “Boathouse” restaurant in Central Park. After a great evening to get to know each other they were ready to start the tours and shows in New York. Everyone chose the tours they wanted to go on as well as Broadway shows. Some of the more popular Tours were the 911 Workshop, 911 Memorial and Museum, Brooklyn Tour, New York Yankees Ball Game, and a few other ones. All of the ladies went to Broadway shows including, Jersey Boys, Book of Mormons, Wicked, and Once. And the comment that was most given was that it wasn’t enough time in New York! Well Ladies, there is never enough time in New York! It’s a fabulous city with so many fantastic things to see and do! 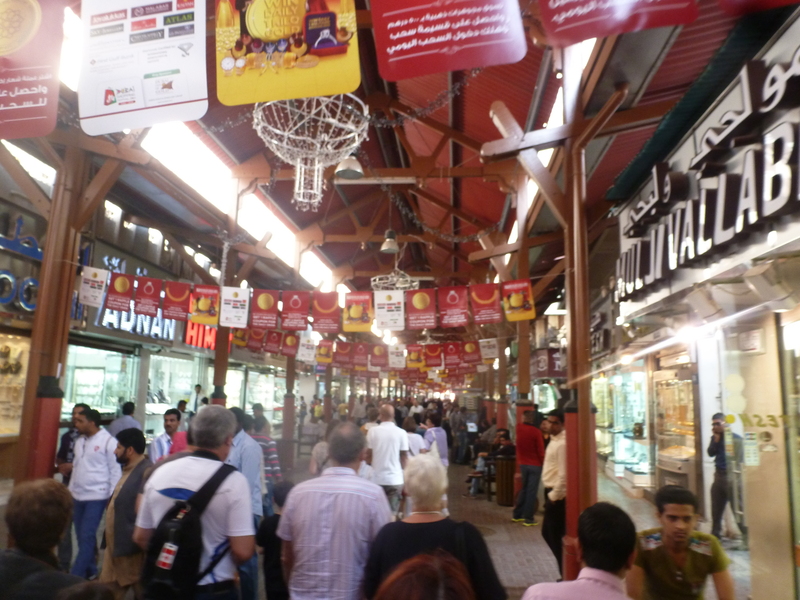 Today is our second day in Dubai and we went on the “City of Merchants” Tour. 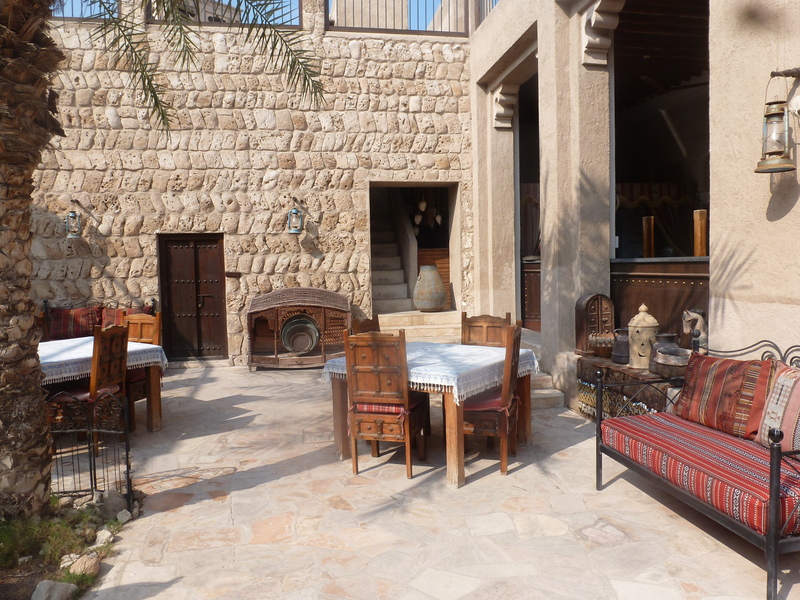 The tour is a tour of the Traditional part of Dubai. Our first stop was a photo stop at the Burj Al Arab Hotel that’s shaped like a sailboat. A truly magnificent hotel both outside and inside. Cost of stay at this hotel starts at $2700.00/night and the most expensive is $27, 500/night. Advantage with the expensive room is a helicopter pickup at the airport and you land on a landing desk at the hotel. You have your own check-in right in your room. This hotel is located in the sea and they claim to be the only 7* hotel, although it is really only considered a 5* hotel. We made a brief stop at the Jumeirah Mosque, the only mosque that allows the public in. Next we drive past the Jumeirah Beach Hotel. 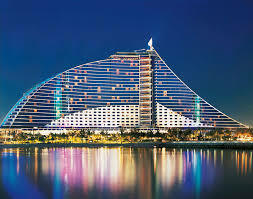 Another beautiful hotel located at the Jumeirahah Beach, and is a family hotel. This hotel is massive and is located on a beach that will rival many in the world! We would loved to have spent a week just spending time there. Interesting note is that Mondays the Beach is ONLY open to Woman. Because of their culture they want the woman to feel comfortable not being totally covered up so they get the beach to themselves. Next stop is the Dubai Museum. It is very interesting to see how much Dubai has changed and grown over the decades. 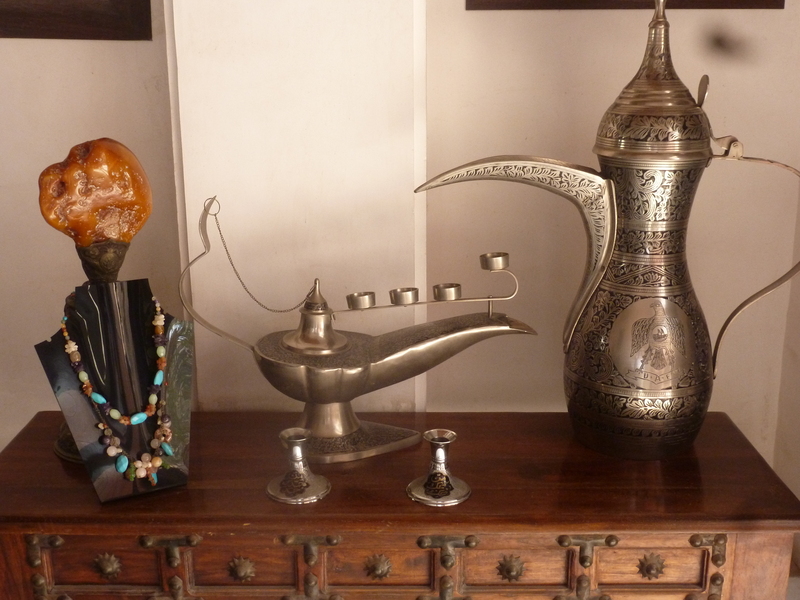 It showed us about the Pearl Industry, Carpentry, spices, Tailors, as well as information about the sea and desert. 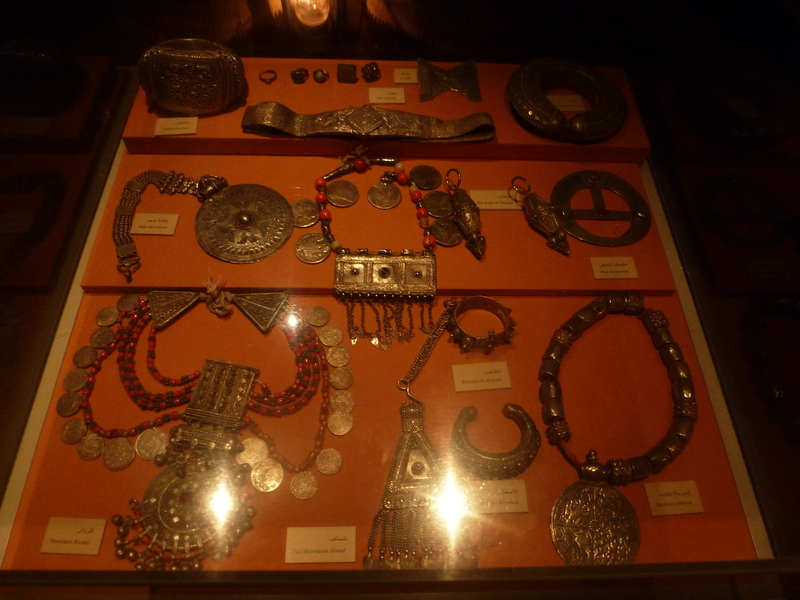 The Museum showed pictures of how Dubai has changed over theyears, the jewelry they used to wear all the time, the trinkets that were in their homes as well as military items. 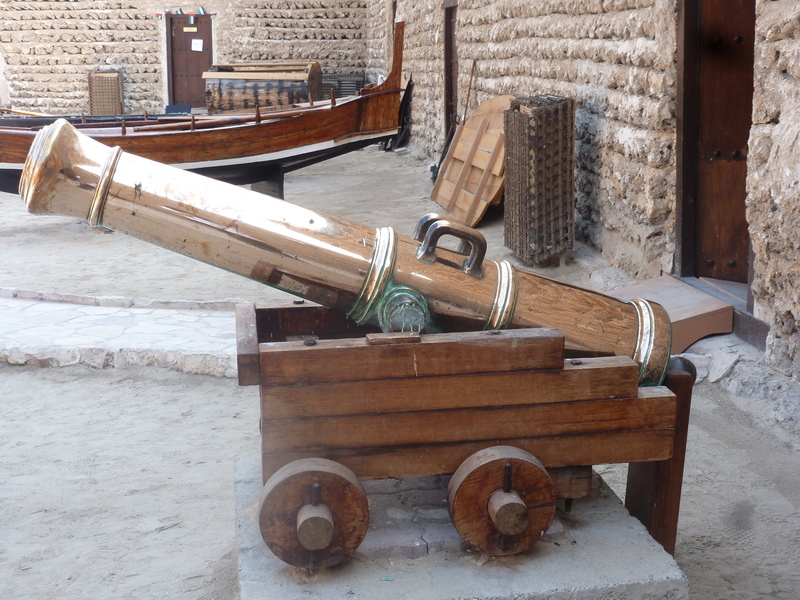 Was great to see the history of Dubai. 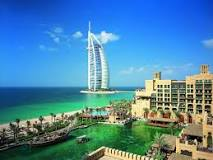 Our next area to visit is very traditional Dubai. 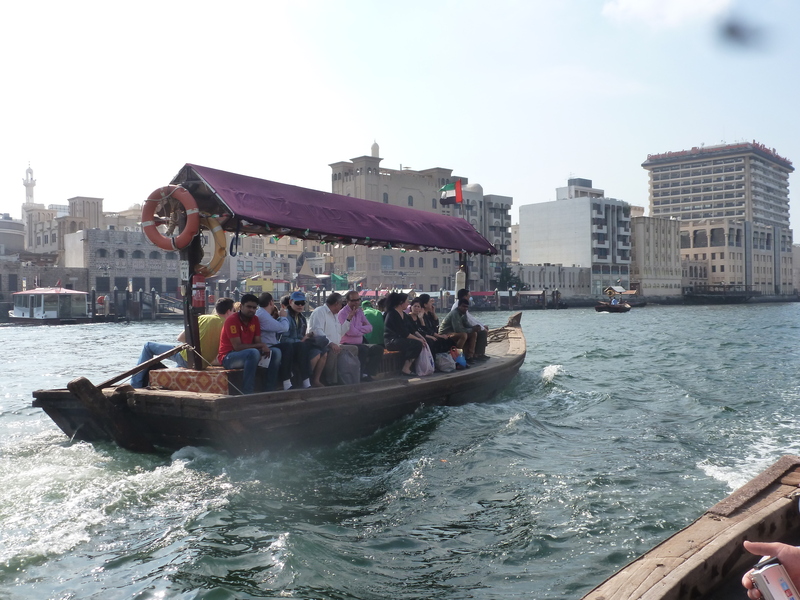 We took a traditional “abra” (water taxi). These are open with just a bench to sit on and hold us to 20 people, cost is $1.00 of their money to go on it. 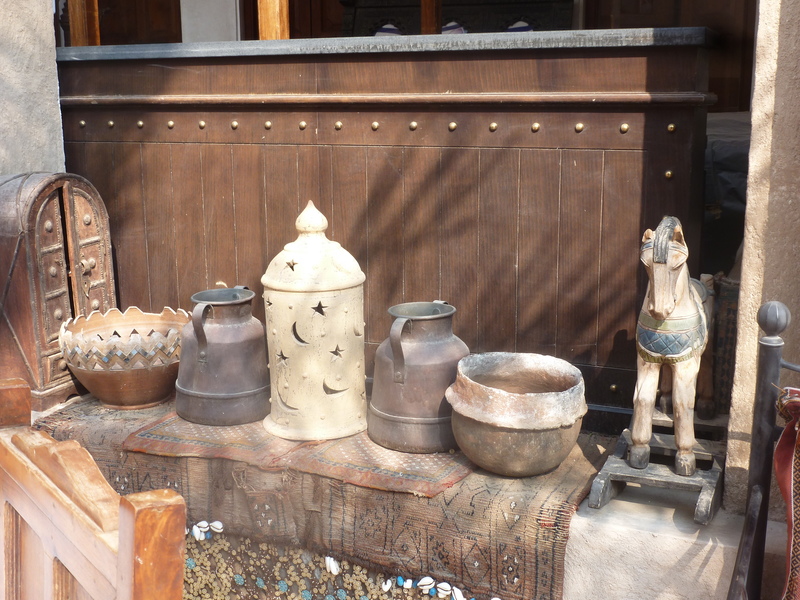 Old Dubai is on the other side where the Spice and Gold Souk’s are. Here you can buy spice by bulk and the Gold Souk is huge with over 200 Jewelry stores where you can buy Gold, Diamonds, precious stones and pearls. You barter at these stores to get the best price. They say that you can usually barter them down 70% from the original price. 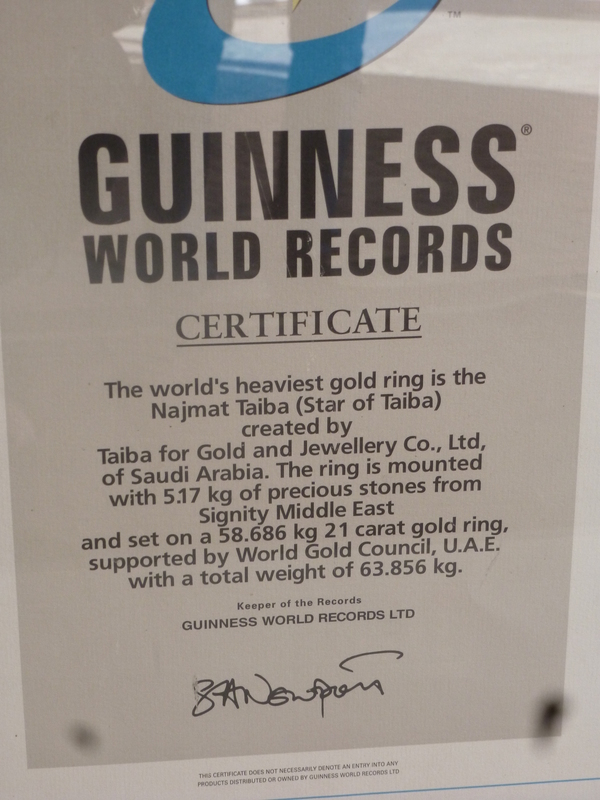 While at the Gold Souk we saw the Guinness World Book of Records heaviest Gold Ring. 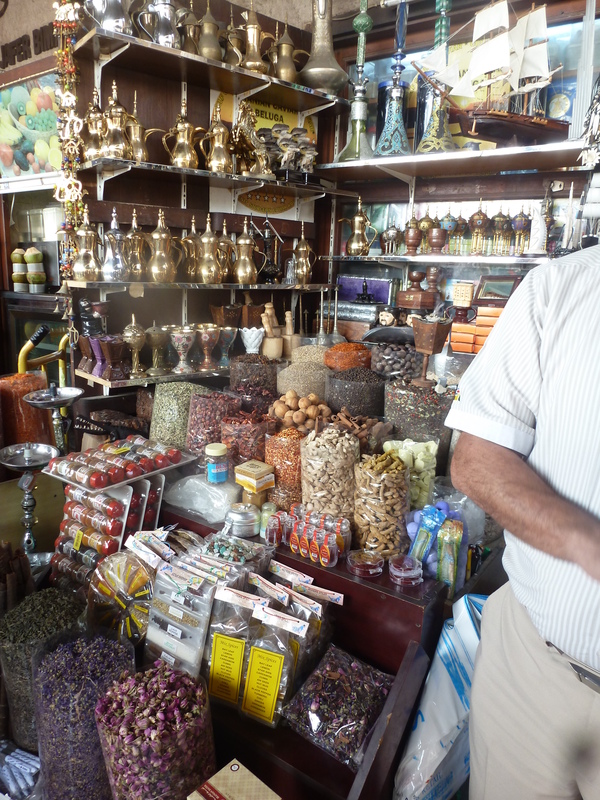 The Spice and Gold Souks were absolutely amazing to go through. If you love jewelry as much as I do, I was in heaven in the Gold Souk! We were looking forward to so much more to see in this amazing city! Dubai isn’t a place I thought I was dreaming of going to, or that I ever thought I would have the opportunity to visit, but my husband was fortunate enough to win a trip to Dubai compliments of Emirates Airline and Kompass Tours located in Dubai. With a few bumps in the itinerary, with us having to fly from Toronto (where we were supposed to fly to Dubai from) to New York because the Toronto flight was oversold. We arrived there and there is was a huge snow storm arriving in New York threatening that we may not make it out that day either. BUT we were fortunate enough to be the only plane that took off. Emirates Airlines were so gracious in upgrading us to Business Class! And let me tell you…what an experience. Neither Lorne or I ever thought we would be flying anywhere in business class. What a treat! Full lay down beds with duvet to out under you so its more comfy, all the drinks you want, food was amazing, a bar in the back of the place as this is the double-decker plane that Emirates owns where economy class is on the bottom and Business and First Class AND a bar are on the top-level. Emirate Airlines is unbelievable. The service, was out of this world. And because I think the world is getting way to casual, it was such a treat to see the Flight attendants (men and woman) dressed in professional looking clothes, their hair was styled (womans up and neat and mens short and clean-cut). The woman’s makeup was impeccable. After talking to one of the attendants, said that Emirates is very specific about the type of people they want to represent their company. It was refreshing to see and hear! After a very long flight we arrived at Dubai. The airport there is beautiful. Very streamlined and easy to get around in. We were met by a representative Arabian Adventures and taken to our hotel, The Ascot”. This hotel is located in the middle of the city in the Computer area of the city. Apparently Dubai has different areas designated to different products like Computers, etc. There were small computers stores side by side everywhere with just boxes of computers and accessories in them. Out hotel was okay, not one that I would send my clients to, but okay. The pool wasn’t heated at all, the food wasn’t great there, the rooms were small, but clean. Our adventure began in Dubai and we were looking forward to it! Imagine floating along 3 Rivers, through 5 Countries, past Fairytale Castles, picturesque vineyards, and amazing countryside. The Grand European Tour starts in Amsterdam and tours along 3 rivers, through 5 countries, stops at 9 UNESCO World all the way to Budapest. 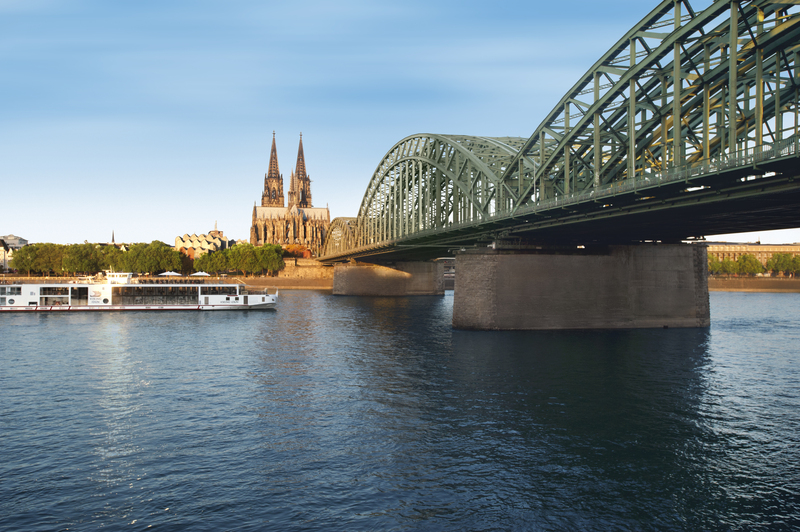 River Cruising has so many benefits for a rewarding vacation. The onboard experience is much more relaxed than a Oceanliner, with no crowds, no long lineups, the general atmosphere is more relaxed, therefore making it a more enjoyable experience. Meal times are a major focal point where it’s on a more casual atmosphere, the meals are unbelievable featuring regional specialties and contemporary cuisine and with it being a smaller vessel you will get to know more of the other people onboard. 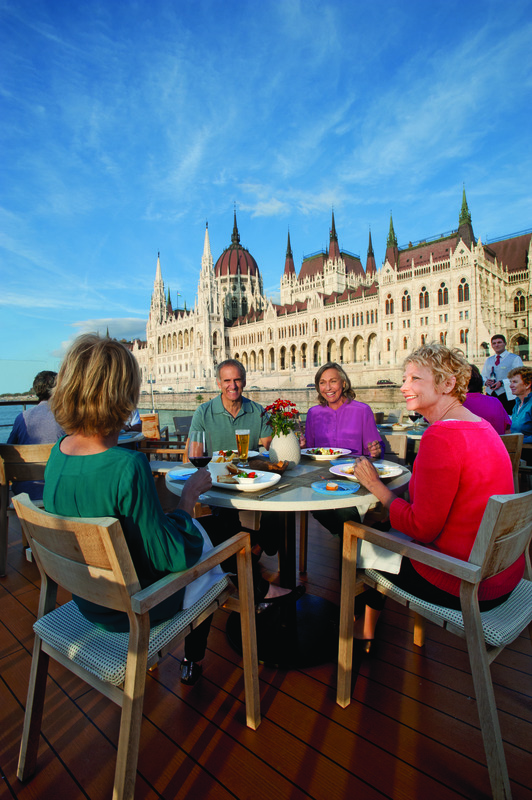 On most River Cruises your wine, beer and soft drinks are included at onboard lunches and dinners, as well as 24 hour complimentary cappuccino, coffee or tea, along with so many other extras that you don’t get on a Oceanliner. The itineraries on a river cruise focus more on the smaller towns and villages because they can navigate into the smaller ports. These are places you won’t see on a Oceanliner. These intimate places are a way to see what the life if like in the different areas in a country away from the large centers. On the Grand European Tour you will have 13 guided tours included in your itinerary, complete with audio headsets in the language of your choice. With a vast array of Cultural experiences, enjoying concerts featuring Austrian Classics and Baroque organ music, you can attend lectures on current affairs in Germany, Holland and The European Union; experience a Viennese market and even learn how to make Rudesheimer coffee. And how about learning the art of glassblowing or listen to the music of Mozart. These are just some of the amazing experience you will have on a River Cruise. What you won’t find on a River Cruise are Casinos as well as there is very little entertainment except possibly a piano player or a local act brought on to entertain you. But that is what makes the River Cruise Experience so wonderful. You can go off the ship at some ports to experience the nightlife in a local pub or a cultural experience that is going on. You won’t have a huge water slide in the middle of the ship, instead you will have a quaint dining area, or on top a mall swimming pool with deck chair around to sit and enjoy the beautiful scenery as you are floating along the river to your next stop. River Cruising is really all about an amazing Cultural experience. Join us July 12 – 26, 2015 on this amazing journey through the Netherlands, Germany, Austria, Slovakia and Hungary. Wow is all I can say. I to own a small business and most of the time am running it on my own. Emergencies and Family obligations do come up, and I to close the door early. Its true that the owner is the Last to get paid, because I want to make the experience in my office more appealing, or that I pay my VERY hard working agents so they will stay with me and provide the great service that we give our clients. 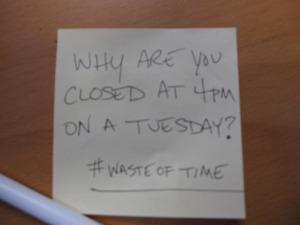 So, please always remember that the person that closed their door early was gone for a good reason, and didn’t do it to “waste your time”. Thank you for this blog post. it says everything I have wanted to say! It took me a couple of weeks to write this post, because I wanted to make sure that I got it right. I had to let it marinate for a minute. After a particularly grueling day, personally, a couple of weeks ago, I came in to the shop to find this note laying on the floor. It had been pushed through the mail slot by someone who was obviously #tickedoff at me for not being here. The Posts that you see on South Africa are Thanks to Janet Plante. Janet and her husband Pete travelled with my group to South Africa in November and she kindly shared her expereience. We took 24 people to South Africa with us and it was an amazing experience! With our first stop in Washington where we did a tour of the city and everything it has to offer we were so glad that we made that stop on our trip! there is so much to see and experience in Wasington and could easily go back there to see more. With the Expertise of our amazing Guide Chris Hanson, we gained alot of great information about Washingtons history and places of interest. As you can see from Janets Blog on our trip we travelled alot, saw alot and experienced so much it was overwheling but amazing. From the Beautiful city of Capetown, Table Mountain, the Winelands, and Boulder Beach to see the Penguins. The Boat Tour in St. Lucia where we saw Hippos, Crocodiles and many birds, was fantastic. To see the Hippos up close in their habitat was so great! Then our favorite part came with the first Game Drives. We were loaded in the 4X4 vehicles and out we went to see what we could find! The one afternoon was so amazing. Unfortunatly some of the people stayed behind as they were tired, and it ended up being the best drive! We saw an Elephant only a few feet away, Giraffes right on the road in front of us, Rhinos, and a leopard! I can’t even begin to describe what it felt to see these animals up close in their own enviroment. You can see them in a Zoo, and its not even close to the feeling you get seeing them in the wild! We went into Swaziland where we went to a Candle Factory and watched them hand make beautiful candles and shopped in the local market there. We then went to the Chismo Safari Camp where we would be spending our next 3 days. We were fortunatre to see so many more animals like the Male Lion with a kill. One of our jeeps watched him come out of the bush, turn around and he roared at them. The pictures were amazing! After our games drives were over we headed on the plane to Victoria Falls in Zambezi! Here we experienced the magnificent Victoria Falls! We were there when they were at their lowest, which I thought would be disappointing, but wasn’t in the least! We actually walked over the Land and Boulders that are usually covered by the water from the falls at its highest point! To be able to see how deep the canyons were and how high the water actually goes and how much land it covers was unbelievable! We could see the falls that were running as well, and it would definitly be a great experience to go back and see them at their highest and fastest stage. After all the incredible experiences we went through in South Africa I would definitly go back in a second! There are so many misconceptions of South Africa. People say it can’t be safe…we never felt unsafe at any point in our trip! The people are so friendly there, and its a beautiful country to visit. It’s definitly a holiday I won’t EVER forget and would recommend to anyone! A HUGE Thank you to Deon Romijn for being such an Incredible Tour Guide. There wasn’t anything that Deon didn’t know about South Africa! If you would like more information onn a South Africa trip, please give us a call or e-mail!